For easily accessible, non-technical trail running, the best choice in Sedona is the hard-packed Bell Rock Pathway. It’s named for its central geological feature, the bell shaped red precipice adjacent to Courthouse Butte. 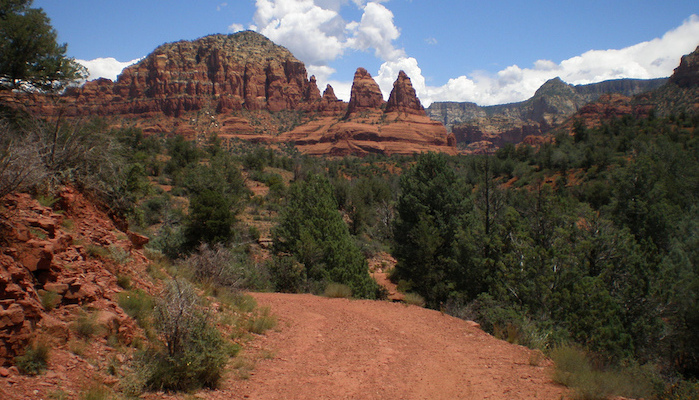 The 3.5 mile path starts at the Bell Rock Vista trailhead just north of Oak Creek. From there, it winds north along Highway 179 (so it can be somewhat noisy). The upland desert mezcla of juniper, pinon, yucca and manzanita offers stunning scenery. The trail ends about 3.5 miles up at the Little Horse Trailhead. For a shorter run, turn around at the Courthouse Vista Trailhead, 1.5 miles in. More experienced trail runners sometimes use the Bell Rock Pathway in combination with the Courthouse Butte Loop Trail, for a 4.5 mile circuit. Note: A Red Rock Pass or an America the Beautiful Pass is required to park at the trailhead.